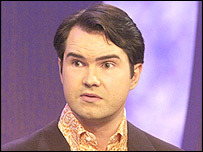 The BBC has apologised "unreservedly" for remarks made by comedian Jimmy Carr on a Radio 4 show suggesting all Gypsy women smelled. On a Christmas edition of Loose Ends, Carr said male gypsy moths could smell females seven miles away and implied that the same was true for Gypsy women. The joke "should never have been transmitted", a BBC spokesman said. A spokeswoman for the Gypsy Council told the Guardian she was angry but "not surprised" by the remarks. Ann Bagehot said she had become used to such remarks after 30 years as the council's secretary. She added: "There are certain groups of people that everyone thinks they can make jokes about and you have to shrug your shoulders and move on." Carr, 33, is a regular guest on the long-running Radio 4 comedy, chat and music show, which is hosted by Ned Sherrin. He has also appeared on TV shows including Have I Got News for You and the Royal Variety Show, and hosted Channel 4 show Eight out of 10 Cats.